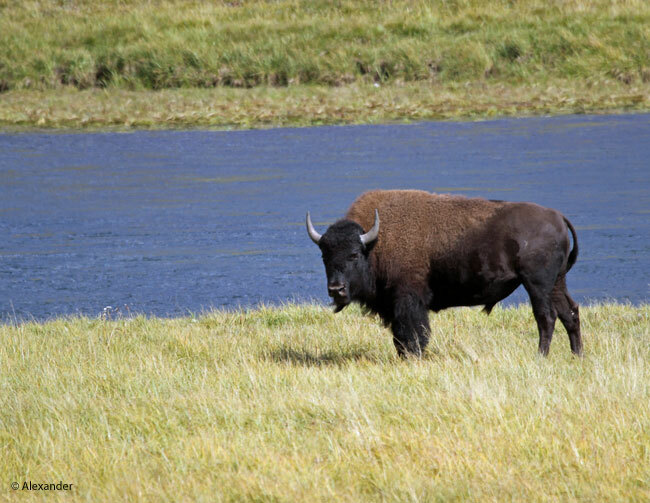 The largest surviving terrestrial animal in North America, American bison still roam the prairies of this continent. It is estimated there were once 20-30 million wild bison in North America. Habitat loss and unregulated hunting brought the numbers down to 1,091 individuals by 1889. Today in North America, after over a century of regulation and protection, there are approximately 500,000. The herd of which many of us are familiar are the Yellowstone bison, seen in these photos. They total approximately 5,000 individuals; and are the only free-range bison population in the U.S. who ancestrally date back to prehistoric times. It is extraordinary that any bison exist today after the relentless slaughter in the 1800s. 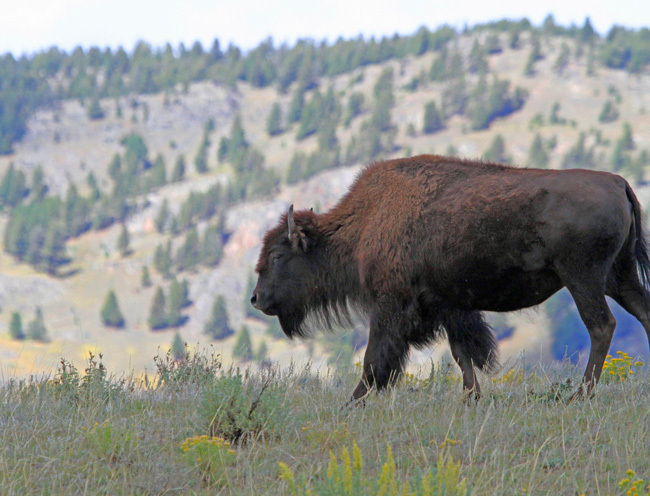 There is a lot of information about the near-extinction of this mammal, and the heroic recovery; many sub-species, different herds in the U.S., and in-depth research about the American bison. Wikipedia Bison gives a good overview. Yellowstone Bison from the National Park Service offers a thorough look at the current herds in this park, including a 2:52 minute video of a just-born bison calf. American bison are creatures of the prairies. Nomadic grazers who travel in herds, they eat grass, weeds, and other plants. Herbivores with an average weight of 1,000-2,000 pounds (453- 907 kg), you can imagine how much grass it takes to satisfy a bison’s belly. They spend 9-11 hours a day eating. 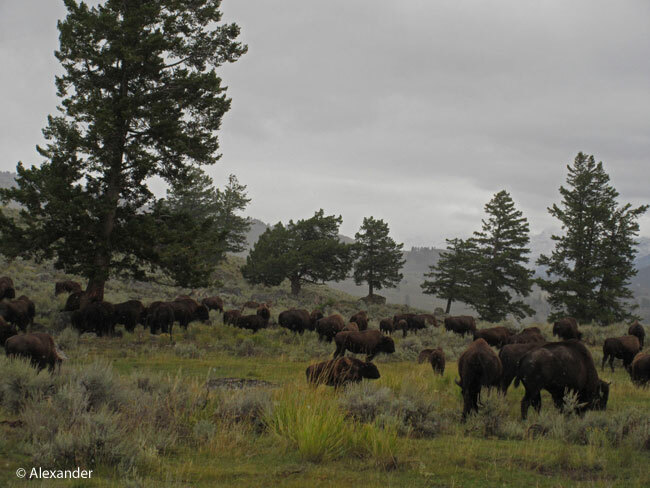 When we were in Yellowstone in September, 2014, some of the bison’s coats were shaggy. Their bodies were preparing for the brutal Wyoming winter months ahead. They have two coats: a heavy one for winter, a lighter one for summer. Also in winter, the bison come down out of the higher elevations to the valleys, where they can generally find more food. See diagram at end. I like this winter note: the bison’s humpback design, with large spaces between certain vertebrae, allows them to use their head as a snowplow. Swinging their head from side to side, sweeping away the snow, they can reach the grass even in the coldest seasons. 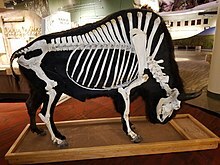 Skeleton of adult male American bison. Courtesy Wikipedia. 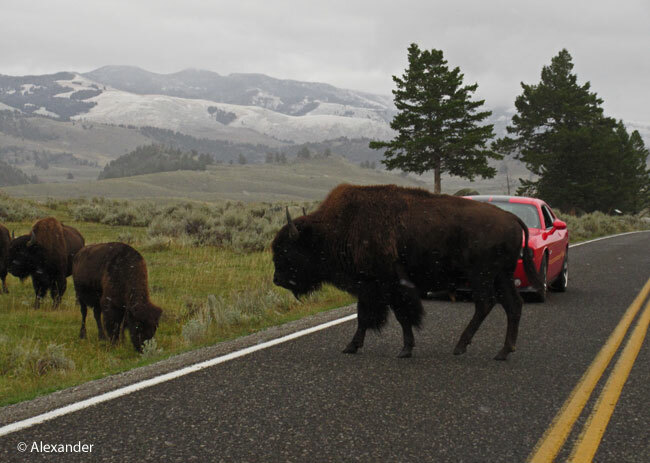 All traffic stops in Yellowstone for the bison. Sometimes they meander so close to the car that you can hear them breathing. I found it so intimate, hearing the deep, labored breath of this behemoth. A huge animal that exists on mere grasses, still roams the prairies after millennium, adjusts its wardrobe to the season, and thrills visitors from around the world. That’s a remarkable animal. Yellowstone bison range, courtesy Nat’l Park Service. 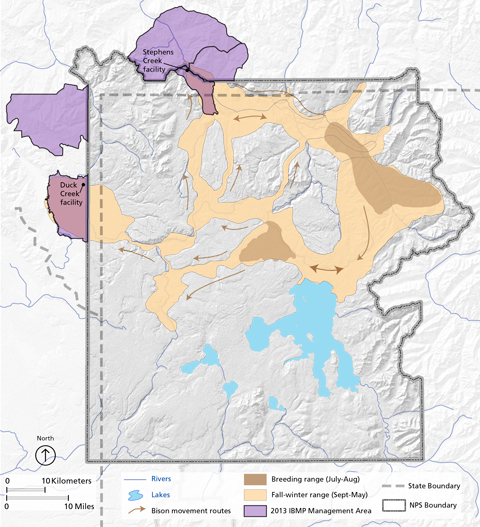 Light tan is fall-winter range, brown is breeding range, purple is Bison Mgmt Plan area. Blue is lakes. Last week I watched Dances with Wolves again and the scenes of bison hunting by the Sioux are still very captivating. Your post and wonderful photos are perfectly timed! They are such a powerful animal, truly thrilling to watch. And how timely that this post came to you having just watched Dance with Wolves. Thanks so much, Hien, I enjoyed your comment. Most informative and heartwarming post Jet! So glad to hear that protective measures are working. And your description of being so close you could hear them breath was powerful. A joy to bring the bison to you, Belinda, I’m really glad you enjoyed it. Thanks so much. Such amazing animals Jet, thank you for that interlude to the day. Fantastic photos and I loved the Yellowstone video of the newly born calf – it started jumping about pretty quick! I’m glad you had an extra moment to watch that brave little calf on his first day of life. They do start jumping very soon, don’t they? Always a pleasure, Alastair, to have you stop by and share your thoughts. Many thanks. I must say that I’ve never seen the American Bison up close for myself. They must be one awesome animal to see. Like you stated, the American Bison was once hunted so bad back in the 1800’s, that they went almost extint. Thanks to all involved to bring back this powerfull animal to the open Prarie. Nice Post. The bison is by far the mammal we saw most at Yellowstone. So if you ever want to have an up-close view of this extraordinary beast, Les, Yellowstone is the place you can count on seeing them. Meanwhile, I’m glad you had the chance here to become acquainted with them. Thanks so much for stopping by. A magnificent mammal, and wonderful words and photographs here. It’s always a thrill when we see one (or more) roaming the grasslands. Thanks, Jet, and have a great weekend! They truly are a magnificent mammal, thank you pc. It sure is a thrill, and oh how lucky we are to still have the bison roaming our earth. Many thanks for your visit today, and as always, I really appreciate the comment. Sending smiles for a happy weekend ahead. I love bison, and have seen them many places. Yellowstone is the best area to see them, by far. The rest of the park isn’t bad either. Hard to get a good look in places like Utah’s Henry Mountains. Yellowstone is wonderful. What a great post, Jet. Bison are such fascinating creatures, it was nice to learn so much more about them. Thanks so much for sharing your wonderful photos with us, too. My thanks, dear Jill, for your visit and kind comments. I am happy you enjoyed the post about bison, indeed they are fascinating creatures. Yea, bison! It’s amazing that such a large animal lives on grass. I find that fact amazing too, David — such a huge animal that just eats grass. Thank you. Great post. Interesting you talked about hearing their breath. We were tent camping once in eastern Montana and a bison walked through the campground in the middle of the night – mere feet from our tent. 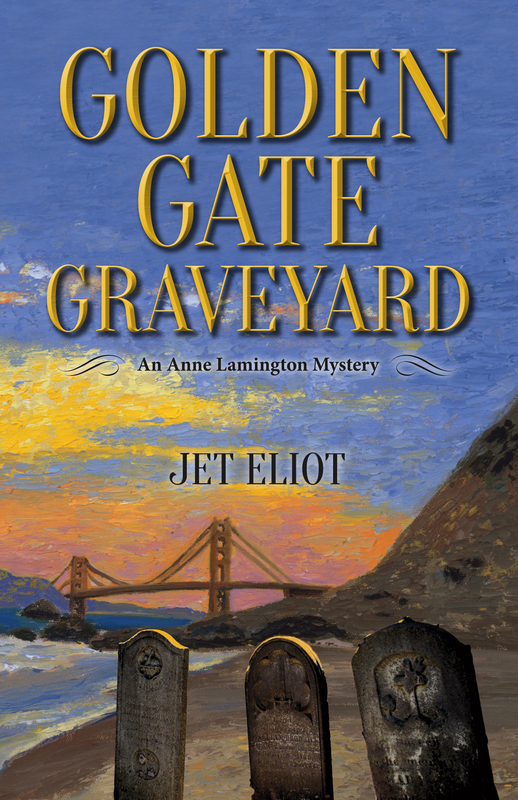 We could hear his heavy breath and feel the ground shudder beneath his heavy feet. It was a little too intimate for me! Yes, that would be a scary intimacy with the bison. Hearing their breath from a car is a lot more cozy than from one’s tent. I like hearing your memory about the ground shuddering too, Nan. They are such big creatures. I can imagine that thunder we read about from the stampedes in earlier centuries of the bison. My thanks and big smiles to you, glad you survived the night the buffalo visited your campsite. Let’s hope they can survive in a way that doesn’t impact ranchers and farmers negatively. It would be a real shame to allow this species to disappear. Great photos. What a thrill it must have been to be up close to the bison. Yes, that’s a good hope to keep in mind, for there are always those conflicts with the big wildlife, like wolves too. Thank you Anneli. That would be terrifying! Glad you survived, Bill, and thanks for this addition to the bison post, I really liked hearing your version of intimacy with the bison. Not the most handsome dudes but definitely noble. Your words express it beautifully, Jan. Many thanks for your visit and the smile you just gave me…. 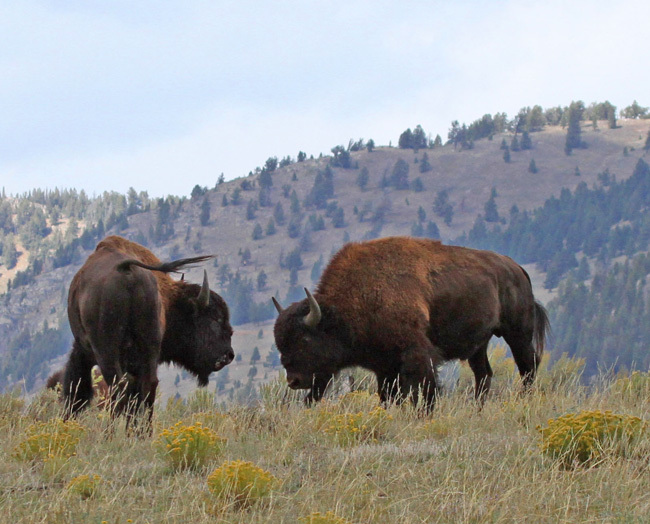 As always a very informative post…..I remember reading the stories of the Bison roaming the plains and the thunderous sounds that came when they stampeded….all but gone in our country. Happy to read about the efforts to save this species…remember some small herds in the front range of the Rockies east of Denver (protected but by whom or what organization not sure….love the pictures and love to see their numbers growing! Thanks for sharing! I’m happy to hear you enjoyed the bison post, and especially glad to know that you remember small herds in the Rockies. Thanks so much, Kirt, I always appreciate your visits and enthusiasm. A great post and photos again, Jet! This impressive beast truly is a remarkable animal. We got to see them in Yellowstone NP and Custer SP (SDakota). They can stop traffic for hours, I couldn’t help but find this amusing. Probably because we were lucky and got pass after only 30 mins. (lol) while the traffic the other direction was backed up for a good mile or more. Having one at your window, breathing heavily, was downright intimidating. My goodness, they are huge! I’ll never forget being able to be so close to them alongside the road. It was truly amazing! 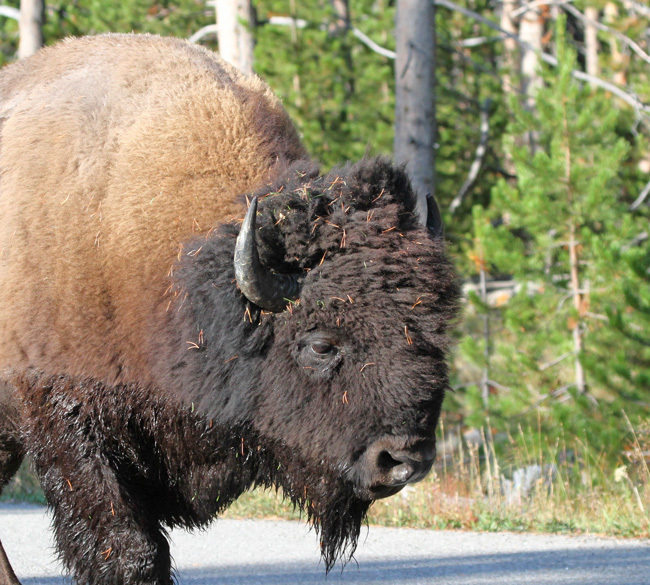 You captured well the thrill of coming across the bison in these national parks, Donna. It is amusing to see everyone stopped, and like you said, sometimes in really long lines, for the bison. Thanks so much for your contributing memories and experiences. A remarkable, majestic animals. Great photos, Jet. 20-30 millions down to over one thousand… Good to read about the effort of saving them. Yes, it is heartwarming to have the bison still here on earth with us, isn’t it, Amy? Great efforts from so many for so long. I appreciate your visit and comment, thank you. There are a few folks around here who raise them, but most are ‘beefalo’ crosses. I read The Nature Conservancy is attempting to purge one of their wild prairie herds (not sure where) of all cattle DNA mixes, so as to have a genetically pure bison herd. Trying to right past wrongs, god bless them! Interesting about Nature Conservancy’s DNA herd mixes, Eliza. 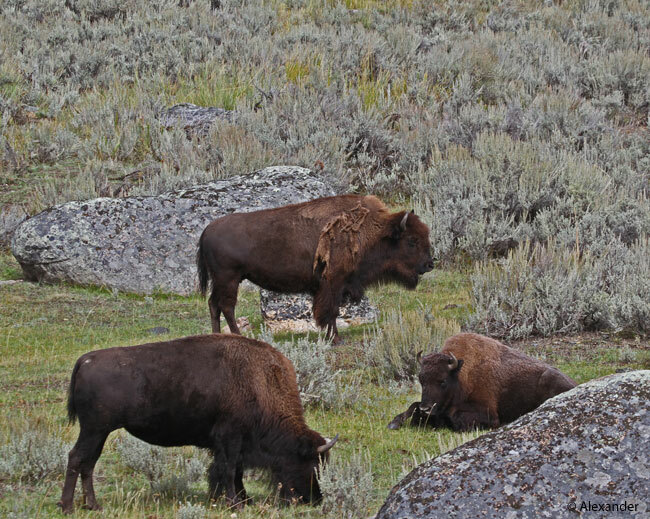 There is a lot of hybridizing in the bison, and that’s why the Yellowstone herds and their pure ancestry are apparently a big aspect in the world of bison. Originally the population got so low that they started mixing DNA in an attempt to keep the population from going extinct, and from there things just evolved. It is a very involved topic that I know only a little about, but it is interesting. Thanks for your input. Those bison stampedes, yes, HJ, what a sight that must’ve been. I’m glad you have seen them in the wild in Yellowstone, it helps with imagining the stampedes. Thanks for your visit, my friend, and your comment, much appreciated. I enjoyed the excellent photos of the YNP bison. They are magnificent animals. A couple of times each year I visit the National Bison Range here in western Montana where there is a resident herd of 300 to 400 bison and enjoy seeing them as well as a large assortment of other wildlife that shares the refuge with them. Thank you for the re-blog, Sharon. Bison must really be a sight to see in real life Jet, thanks for sharing them with us. They are a formidable creature to be in the presence of, Andrea. On cold days steam comes out of their mouths and they resemble fire-breathing dragons! I’m glad you enjoyed the bison, thanks so much for the visit. They are such impressive animals! Fantastic blog, thanks Jet! I am happy your enjoyed the bison post, Dina. Thanks so much for your visit. The last time we were in Yellowstone, bison came all around the stopped vehicles and one right in front of our van. They’re huge and awesome in the true sense of the word. I imagine sometimes what it must have been like when the herds stretched as far as the eye could see!! Slaughtering them just to be killing was a horrific thing. But I’m glad they’re making a comeback. Yes, they are an incredible animals, Janet, and I am so glad you’ve had the joy of experiencing the bison up close. I, too, am really glad we still have them on this planet. Many thanks. The only bison I would eat, David, and oh so delicious. Glad you liked that little bit of comedy I threw in. Beautiful photos and wonderful information about these remarkable animals! I loved your description of hearing them breathe as they walked by the car. I’ve never had that close of an encounter, but I did think some of the bison we spotted on deserted roads on our motorcycle trip out west enjoyed hearing some music as we drove past them in the fields. Thanks for sharing the interesting links. So glad you enjoyed the bison post, ACI. We don’t forget our bison sightings, do we. Enjoyed hearing about yours, too. Many thanks, my friend. They are magnificent! And You taught me 2 things I’d never known about bison!!! I love knowing that I taught you these two important facts, Katy. lol. I just love Yellowstone National Park!! Wish I could go back there some day soon! Jet, how very rare and satisfying to read a story about an almost inevitable and inescapable end of an endangered species. The horrific and wanton killing of millions of native bisons “for sport” is just one more reminder of how pathetic and destructive these early generations of Western settlers were. How sad must it have been for Native American tribes to observe the ruthless slaughter of their fauna. Of course, the murderous destruction of the Native American buffalo went hand in hand with a similar destruction of so many Native American tribes, populations, customs and basic right to exist in their native land. While there is some inkling of positivism in the rebounding of the American Buffalo, now to 500,000, a great reminder that counter extinction efforts can be successful. There is sadly no such rebound available to America’s native people. This week, the American electorate voted to send a rebuke to Trump and the “blue wave” included the first ever Native American senator. That it took 260 years of supposed democracy for a single elected representative to take a seat in congress is in and of itself shocking. But in the spirit of the positive outcome on the American Buffalo that you describe, we can take solace in the recent court decision in the US to block the Trump administration’s oil pipeline project which was guaranteed to deliver massive negative environmental impact in the American plains and Native American communities “protected lands”, that the pipeline was to go through. The American Buffalo is a magnificent creature and the photos on this post do them great justice. Bravo! Glad you enjoyed the bison post, Ben. While I appreciate your political enthusiasm, I prefer not to discuss politics here, thank you. Fantastic post about this amazing creature, Jet. When I see them at Yellowstone, it’s easy to think you can get close since they are slowly lumbering around, but then realize how menacingly big they are, especially now that I’ve learned about their “snowplowing spines”! Also, I wasn’t aware of the awful mass slaughters. Ugh. The slaughter was not just to kill all the bison, but to starve out the Native Americans who were dependent on the bison for food. It’s an ugly historical fact. I preferred, in this post, to celebrate this unusual mammal and the population’s recovery. Glad you enjoyed the post, Jane, and I’m really glad you have seen them. Quite a marvel. Thanks so very much for stopping by. The American Bison is my second favorite animal just behind horses! Thanks so much for the re-blog, Adrienne. Thanks for another wonderful and informative post, Jet (and Athena!) The winter shots of the bison in winter made me shiver. They are some remarkable animal adapted to that sort of weather. Brrr… Thank goodness we had the sense to preserve these great animals. May they ever roam! I’m with you, Gunta — “May they ever roam!” Thank you as always, my friend, for your visit and warm comment — much appreciated. Thank you for giving us this wonderful post. Introducing the Bison so close and real. These massively built animals carry history and knowledge within and you can sense it as you look into their eyes. I am glad you came so near one as to hear the breathing from these big lungs. The Bison looks unbothered. The nearest I have come to big animals like that is having Elk family next to the car. It is a joy to hear that man is working on restoring what was harmed. Thank you, Miriam, for your thoughtful comment. I am happy you enjoyed the bison post. Every time we’ve gone to Yellowstone, I am always in awe of this amazing animal. Thank you for this post Jet. Wonderful as always. Always a treat to have you stop by, Sylvia, thank you for your visits and lovely comments. I, too, am in awe of the bison. I am not sure how one passes on chocolate…lol. Thanks ever so, RH. They are such beautiful beasts! I learned things I had not known of them. Thank you! Sigh…I want to pet them! 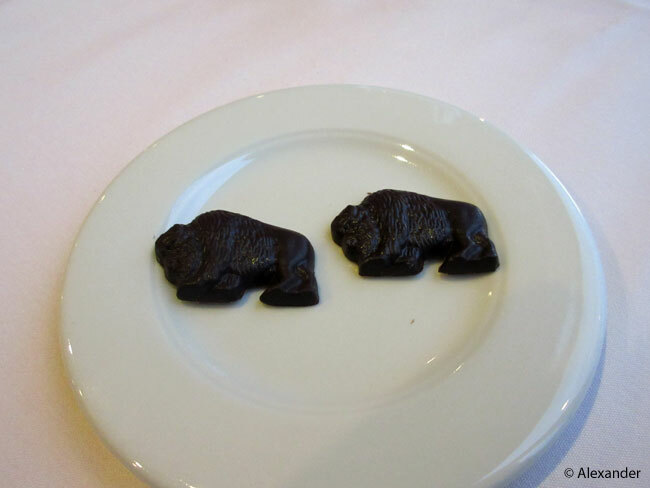 I am happy you enjoyed the bison post, Dawn Renee, it is a pleasure to see you visiting, thanks for stopping by.